One of the things that fascinates me with photography is all of the interesting people I have got to meet, and the diverse reasons why they do photography or modelling, or in some cases both – some of the best photographers I know are models, and all photographers can learn a lot from them! It makes sense in a way, I have probably worked with around 10 other photographers, whereas some models have worked with 100’s of the best photographers, and probably picked up tips from most of them. As people we all have an ego, and as photographers we like people to like our work to boost our egos. Models will look at the images on the back of a photographer’s camera during a shoot and say how wonderful they are, which is good when you are a beginner, but as you get more experienced the good models feel confident enough to tell you when something is not really working, which all helps to produce a better image. I, along with many photographers I know, enter exhibitions with our images. Gaining acceptances or even awards in exhibitions is a great fillip to the ego, as well as being a way of showing improvement in our photography. In the big exhibitions there can be around 3000 images entered into a section, then usually between 20-25% of those images are accepted to make up that section of the exhibition, and a small number of them are then given awards, and depending on the exhibition there can be between 1 and 3 gold medals awarded per section. So it’s pretty special when you win a gold medal, and although I have been very fortunate to win quite a few I still get a little rush of adrenaline when I hear about winning one. I remember explaining about exhibitions and awards to a model who had asked about them during a shoot, and she said it was such a shame as there were no competitions or awards for models. Now, I’m not going to start running competitions for models, but I can express my gratitude in another way. I offer all models I work with copies of any images, and prints if they wish, which they take up to varying degrees. Nanette McCrone has had numerous prints of two of our successful images, Pearls and The Piano, which are now hanging in her home and those of her relatives. However, I have now taken this a step further. 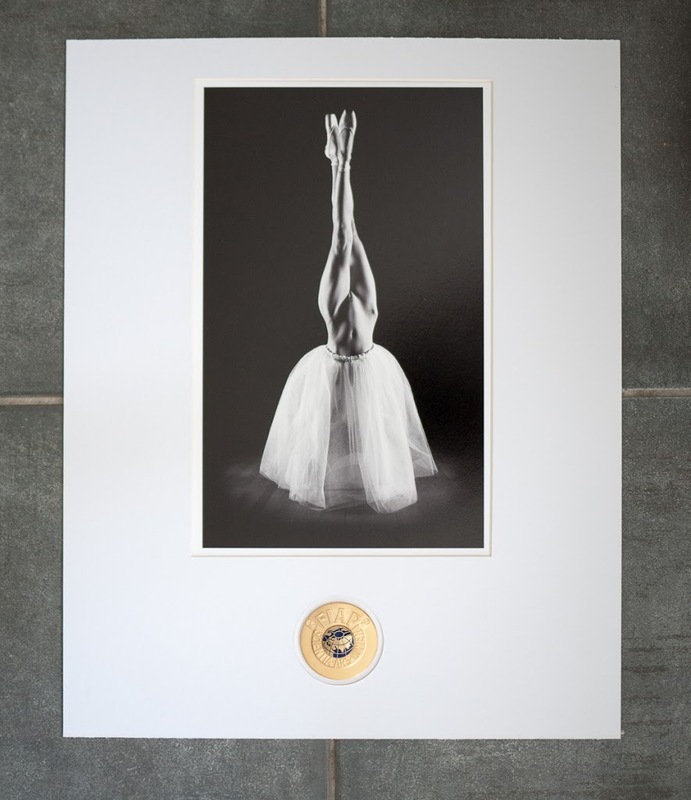 My most successful image in terms of medals is En Pointe with the incredible Kayleigh Lush, so when she came to visit last time I offered her a copy of the print, but with it’s own FIAP gold medal, one of the many it has won for me. I am working with her shortly so have got around to mounting it, cutting a round hole in the mount for the medal was trickier than I first thought! Kayleigh was over the moon when I offered her the print and medal, and I can honestly say it will give me as much pleasure giving it away as it did winning it, as she was as much it’s creator as me. I suspect she will probably not be displaying it in her lounge at home, she has in fact told me where she will put it up. What a great idea. I’m sure you are one of the few, if not the only, photographer(s) who has done something like that. I know your attitude towards models which should be an example for many photographers. At least I have learned a lot from it. Your honesty about what skilled models do for a photo does not detract at all from your talents as a photographer. Antonio Stradivari could not have created his instruments without the unique wood. Mr Pope, your thoughtful comments are always welcome, and thank you for your kind words. Picking a good model is just as much a skill as composition, and you need all elements to work to get a great image. a good post Tim and a nice touch to give Kayleigh a medal and print. Thank you Richard, is is nice for them to have one of their co-creations. I once watched a TV program about the great golfer: Arnold Palmer. He had a coffee table with all of his gold medals embedded in the wooden top beneath a glass plate. Each time he won a new medal he had a new empty aperture cut. The idea being that the blank space gave him a reminder that he needed to win another medal!